Career management is an employee-driven process with support provided by managers and the university. 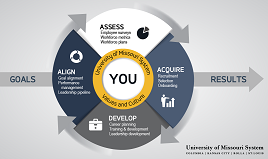 The process enables the UM System to achieve its strategic goals by helping employees manage meaningful careers. Career management is but one piece of a broader goal to recruit, retain, and rewards faculty and staff. Review the UM System Talent Wheel (PDF, 703KB) to see how career management fits in.